A large full-moon tide will coincide with strong winds, snowfall, and a moderate 2-5 foot storm surge this weekend, leading to the possibility of coastal flooding across our region. The areas at most risk for major flooding are Virginia, Maryland, Delaware and southern New Jersey, but minor-to-moderate flooding is likely from Hatteras to Northern New Jersey. At most, only minor coastal flooding of low-lying areas is expected for the New York / New Jersey metropolitan area with the forecasts seen so far. Any coastal flooding will likely occur Saturday or the first half of Sunday. 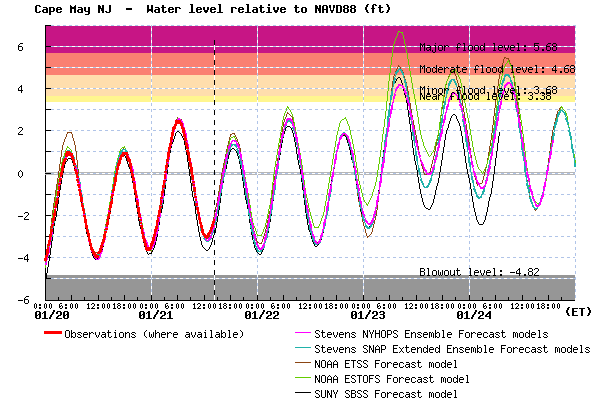 Although there is still moderate uncertainty, forecasted flood levels are roughly similar or slightly worse than those which occurred during the nor’easter that caused flooding in the same areas early last October, at the time that Hurricane Joaquin was threatening to come towards the East Coast. Winds will be stronger, but the duration of high storm surge will be shorter, lasting through about three high tides. In terms of waves, NOAA is forecasting maximum 18-foot waves offshore, which are similar to the October storm. However the shorter duration of this storm will likely mean moderate erosion will occur, less than in October. Beaches that are in good condition should protect the communities behind them; however beaches left vulnerable during the October storm will be weakened even further. 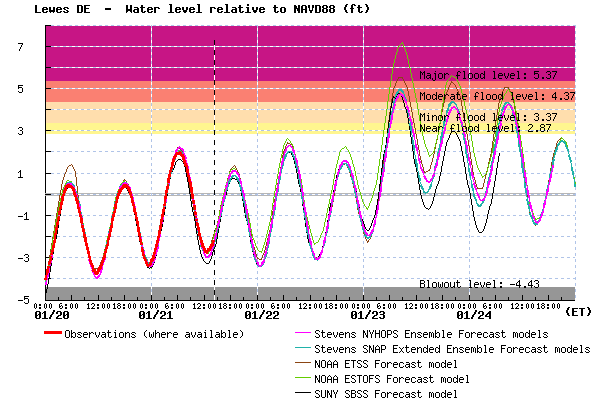 Due to the high tides, any increase in the storm surge or waves could lead to even more flooding or erosion, so we are monitoring our flood forecasts and those of other organizations, which are updated four times per day (www.stevens.edu/SFAS). The above summary interprets all forecasts, including those of NOAA. Below is a detailed summary of the Stevens forecasts alone, which are experimental and available for hundreds of specific locations. The southern half of the New Jersey Coast (Atlantic City to Cape May) is likely to have moderate flooding, and while it is unlikely (0-20% chance), it is possible that there will be major flooding. Expected peak flood levels are about 4-6 feet navd88, which would be similar to the 5-foot flood height that occurred early last October (see figure below). Further south, the outer coastline of Delaware, Maryland and southern Chesapeake Bay regions (e.g. the Norfolk area) will likely have moderate flooding, and major flooding is also a reasonable possibility. Again, expected peak flood levels are about 4-6 feet navd88, which would be similar to the 5-foot flood height that occurred early last October. 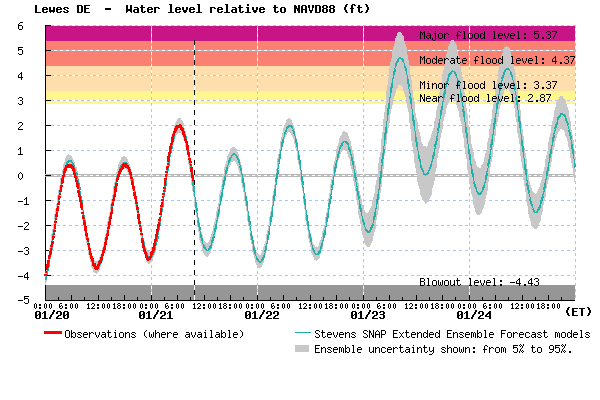 Figure: Stevens Flood Advisory System experimental SNAP forecast for water levels at Lewes (blue), relative to NAVD88 (similar to mean sea level). 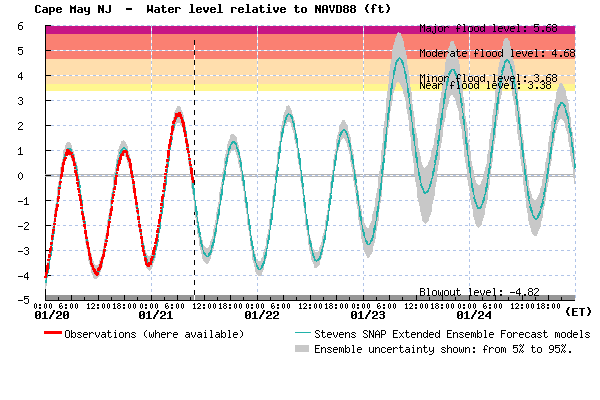 Observed water levels are shown in red, and the forecast uncertainty is shown in grey (90% confidence interval). Below are some forecast comparisons between Stevens and NOAA products, to give a sense of the variation between forecast systems. One of NOAA’s forecasts, ESTOFS, is an outlier on the high side, raising the possibility of an extra 1-2 feet of flooding above what is predicted by the other models. This entry was posted in Uncategorized, water, weather and tagged Davidson Laboratory, Delaware, ensemble, flood, Jonas, Maryland, new jersey, New York City, nor'easter, probability, Stevens Institute, storm, surge, Virginia. Bookmark the permalink.